On 11/11/11, Joy Robinson took a trip down to the Poppy Factory in Richmond to view the unique and exciting artist, Patricia Hammond, deliver a moving performance of her stunning new album Our Lovely Day. Of all the days to visit The Poppy Factory in Richmond, 11/11/11 could not have been more appropriate. Normally, there are no visits on a Friday but this Armistice Day they welcomed a special guest. Patricia Hammond was born in Canada and was brought up with the songs of previous generations. She had the collecting bug but was unable to afford antiques so started to collect sheet music, given to her for nothing and often not considered of any value. Gradually, she realised that the music itself had a value and started to sing the songs from the sheets she was given. These forgotten songs were very unfashionable back then and she recalls one audition when a choice from this decades-old repertoire cost her a disqualification. The sheet music she was given frequently carried poignant dedications, scribbled notes commemorating occasions when these songs were heard, played, or sung. The people who were giving her the music were sharing their memories too. One lady told the story of her Armistice Night as a Wren; they all descended on their local village hallooing and singing and no matter how many different groups broke off to carouse in different streets, they’d all come back together singing ‘Macnamara’s Band’. She had never heard the song again until Patricia sang it to her. 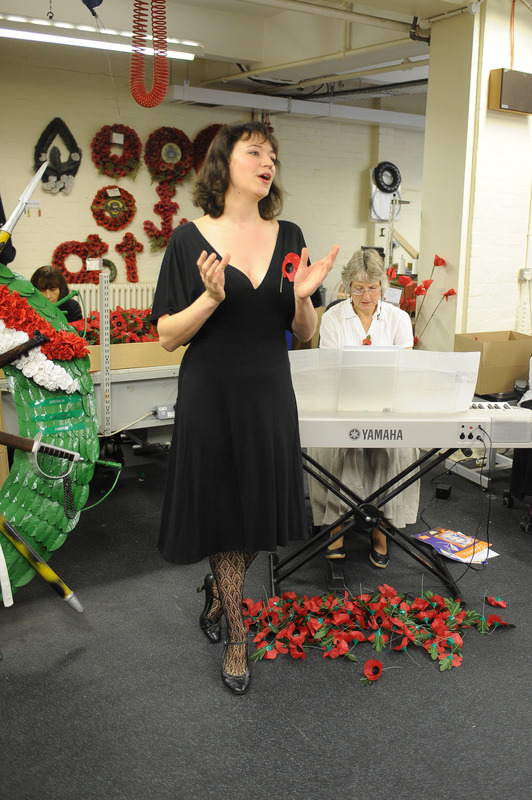 Patricia sang a selection of thesedelightful songs to the people who work at the Poppy Factory, making the 49 million poppies that are sold every year and of course the special wreaths laid by the Queen, members of the Royal Family, head of the Services, and leaders of political parties. We were able to see the special wreaths from 2010, and were struck by the detail, work, and skill involved in making them. We heard Always, Did You Ever See A Dream Walking? and, of course, We’ll Gather Lilacs – so symbolic of everyone’s hope for new hope once peace came. She encouraged us to sing along and although her lovely soprano voice made us rather inhibited, we were soon joining in the choruses and refrains, especially in Let Him Go, Let Him Tarry, Let Him Sink, Let Him Swim, a very jaunty number from Patricia’s favourite film The Way to the Stars. Her sheet music all comes from charity shops; the song Yours was sung from an especially lovely old booklet bearing the unmistakeable face of the lady who made it a huge hit, Vera Lynn. It was a moving performance. The couples who had danced together to this music 70 years ago were on their feet, transported back to the times of their first dances and risked kisses. They were lucky. They had survived the war and were able to enjoy long lives together. But today we were thinking of those who had not returned, and the lonely lives of the loved ones left behind. Patricia and Judith would have them very much in mind tonight, as after this performance they would be heading up the road to sing at The Star and Garter Home. Patricia’s performance for the residents aims to cheer, comfort, and conjure up the spirit of the 1940s with her beautiful voice, charming delivery, and wonderful collection of vintage songs. On a day as historically and nationally important as Armistice Day, her performance at the Poppy Factory more than delivered. She is a total beautiful lady!!!! !